This “pancake” recipe is a Paleo staple that I picked up during the recent 40-day Paleo challenge I completed. I made them today after a bike ride and thought I should share with all of you. Nutritionally, what I like about these is that they use an egg and nut butter to provide filling protein and the carbohydrates are from mashed real fruit (banana, pumpkin or sweet potato) rather than a refined grain that lacks fiber and the antioxidants and vitamins and minerals of fruit. I calculated the nutritionals to be 300-400 calories (depends upon how much mashed fruit and nut butter you use and what you top them with) but with about 10+ grams protein and 4+ grams of filling fiber. 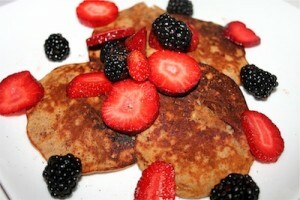 Unlike wheat pancakes that “scream” for maple syrup and butter, these are great topped with fresh berries. They’re delicious, super easy to make and will keep you full for hours. Promise. Pinch of cinnamon, if desired. 1. 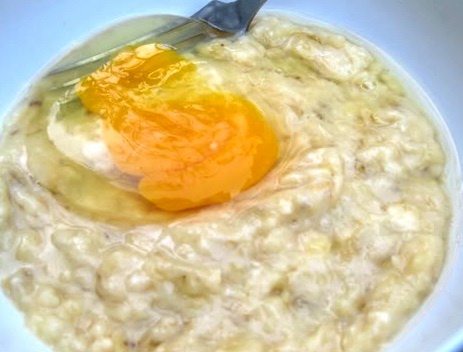 Mash the banana, add the egg and mix well. Stir in nut butter and any spices or extract. 2. 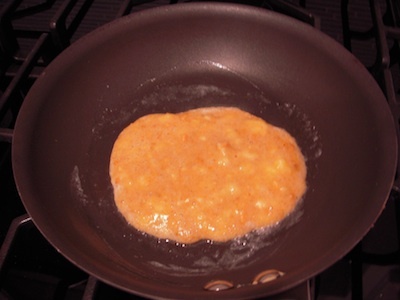 Heat a nonstick skillet on medium heat and use some oil or nonstick cooking spray to ensure the pancakes don’t stick. Pour a large spoonful of batter into hot pan and cook until browned on one side (3 minutes or more) flip and brown the other. Makes 2 medium or 3 small pancakes. Enjoy them plain or with fresh fruit on top, a drizzle of honey or Greek yogurt. You can also substitute the banana for pureed pumpkin or sweet potato. For those of us who can’t make a deascent flour pancake this could be a God send. Thank you for this idea. Yum, I’m going to try these tomorrow morning! All I have are Egg Beaters so hopefully that won’t mess anything up. I will be sending this to my Paelo friend and may try them on my daughter too! THESE SOUND SO GOOD. WILL HAVE TO TRY THEM SOON. GRANDKIDS WILL LOVE! These are amazing and really easy/quick to make, tried them this morning! Thanks for the recipe, just tried it and it tasted pretty darn good. The lower heat for longer is the best choice. I was at medium heat and it was still almost burning my pancakes. Otherwise, tasty and brilliant. I just made these this morning. I think I put the heat too low and it took waaaay too long (~45 minutes from start to finish for a batch of 2). Next time I’ll bump the heat up a bit. Otherwise, pretty tasty and simple! If I use pumpkin instead of banana, how much pumpkin should I use? I came across this recipe on Pinterest and it was fantastic! I even had my roommates try them (huge paleo skeptics…) and they said they were delicious as well. Thanks a lot! If you used pumpkin instead of banana, how much pumpkin would you use? Just made these and I am in love 🙂 what a great idea! Thank you so much! I’m making these right now, and because I tend to not be a patient person when it comes to cooking, I thought commenting on here would give me something to do while I wait for the pancakes to set and brown. Thanks for the wonderful recipe! They smell delicious; I hope they taste just as good 🙂 P.S. this is my first Paleo recipe! i wuld love to win this prize pack … want to start eating heathlier foods, for me and especially my Grandchildren. These Pancake are easy and delicious!! I used a small amount of coconut oil to cook them, on med-low heat, they turned out perfect. I did splurge a little and eat them with a little bit of pure Canadian maple syrup! Delicious, thank you for this healthy Paleo recipe.